Victoria University of Wellington (VUW), was invited as a special guest to the 2011 World Tai Chi and Qi-Gong Day Celebrations in Wellington on Saturday 30 Apr 2011. Dr Chen was very impressed to see how New Zealanders have embraced Chinese culture through the practice of Tai Chi and Qi-Gong. agreed to work together to promote Chinese culture through wushu. The Wellington Confucius Institute is linked to the Confucius Institute Headquarters in Beijing and to the Confucius Institute of Xiamen University where Dr Chen Ben comes from. 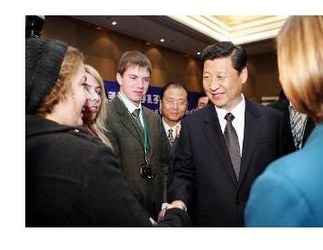 Xiamen is Wellington's 'Sister-City' in China. Monday 21 March 2011 in the Victoria Room at Victoria University of Wellington (VUW). At this meeting, attention was devoted to the CI mission and Strategic Plan, the forthcoming Opening Ceremony and Arts Festival, and Confucius Classrooms and Xiamen-related initiatives. Consideration was also given to proposed programmes and activities of the CI, which cover three main areas: Arts and Culture; Intellectual Exchange; and Chinese-language Education. Potential activities of the CI will include exhibitions, concerts, film screenings, lectures, readings, workshops, conferences and festivals; often to be organised by the CI in collaboration with Chinese and New Zealand cultural institutions. The Branch is looking forward to close collaboration with the CI in the future. 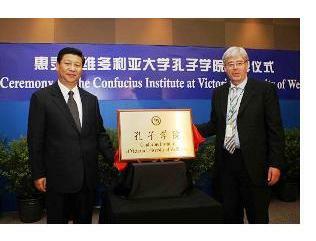 The Confucius Institute at Victoria University of Wellington was officially launched by the Vice President of China Xi Jinping and Vice Chancellor Professor Pat Walsh in Wellington, on Saturday 19 June 2010. Present at the ceremony were also a delegation led by Professor Zhu Zhiwen, Council Chairman of Xiamen University which the Chinese partner university with Victoria University on the Confucius Institute, and a delegation led Hu Zhiping, Deputy Director General of Hanban, the Headquarters Organization for the world Confucius Institutes. Vice Chancellor Professor Pat Walsh said at the launch “This is a significant occasion as it marks the ever strengthening relationship that Victoria University has with the People’s Republic of China” and that he is confident that providing access to this learning and insight in Wellington will prove to be beneficial as the two countries build closer economic ties. Victoria’s Confucius Institute is a joint venture with Xiamen University, which Victoria University has an already strong partnership with. In December 2009, the New Zealand Research Centre of Xiamen University was established as part of the partnership and collaboration between the two universities, forging this strong partnership. The NZ Contemporary China Research Centre has played a key role in the establishment of both the Confucius Institute at Victoria University and the NZ Research Centre at Xiamen University. culture. They operate in partnership with a Chinese university and are financially supported by the Office of Chinese Language Council International (Hanban), part of the Chinese Ministry of Education. The Confucius Institute will operate as a project-based organisation, promoting Chinese language and culture study in New Zealand through educational programs, cultural activities, exams, conferences, events and scholarships. This ceremonial launch marks the beginning of a one-year period in which the Confucius Institute will be set up at Victoria University, in which a Director and advisory board will be appointed.